Next, it was numbing time! I love this; when the tingling starts, I know it’s working and I won’t feel too much during my treatments. Valery decided that she would use the BBL machine again for a few treatments, very similar to last time and also use the “Fotona” machine for a more precise way of reaching my vessels. (The Fotona is a laser that has many different uses.) I noticed some redness on my face from my last session did lessen, but I don’t think the cold Minnesota air helps my red cheeks! I love that Valery is able to adjust the lasers and lights to focus on my particular problem areas. 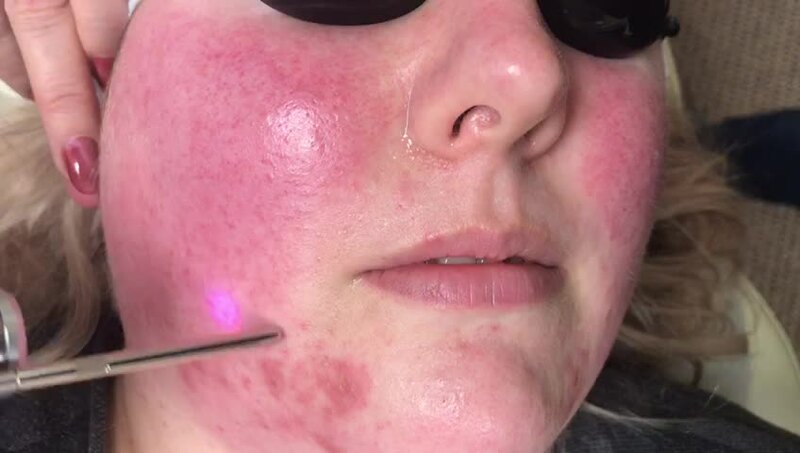 The same lasers that are used for hair removal can be adjusted to work on my redness, potential acne, and acne scars. Valery started to work her magic and that rubber band feeling was back, I totally psych myself out and think that it will hurt worse than it does. Valery also always says that if the feeling is too intense, she is able to adjust the settings so it isn’t as bad. The first wand treatments were the same with the BBL machine. My favorite part of the BBL machine is the tightening wand, it’s warm and like a roller ball feeling on your skin. I honestly can feel my skin tightening right away, its quite refreshing. I didn’t know what to expect with the Fotona laser, but Valery forewarned me that it would burn, but only for a short time and in small areas. She was correct, it did burn a little but nothing this Mama couldn’t handle. Once my treatments were done I was good to go. My face was more red than normal, but this is expected. Within a few hours I noticed some skin peeling off my face, but very minimal. I even went out to dinner a few hours after my appointment, no makeup, and red, but not more red than usual. In my car, about 5 minutes after my appointment. By the next morning, my cheeks were noticeably less red this time and more of a rosy pink! It is nice to see progress and to have before photos to look back to. I go back for my third treatment in two weeks. I am excited to see what Valery has in store for me. Overall, I am really enjoying my experience at Luminous You. I know my photos and videos may look scary, but I promise the treatments aren’t that bad! In the moment there might be a little pain or discomfort, but it only lasts for a very short amount of time. It’s nice to see progress with my areas of concern, this lets me know that the little bit of discomfort is totally worth it! Don’t forget to make your appointment for a FREE CONSULTATION! Valery is wanting to help you too! Remember, you only get one skin…so take care of it! Morning after! Only wearing mascara and lipstick. February 10, 2019 February 14, 2019 by ktplumbLeave a Comment on What’s for dinner?! Hey there friends! Back for another installment of What’s for Dinner?! I have to make a correction, last week I said the meals were mostly from The Pound Dropper, but some were also from The Skinnyish Dish! Saturday: TDB- I’ve been wanting to make Italian Sloppy Joe’s but I keep forgetting so maybe this!